HUGE Kid's Coat/Jacket Blowout Sale! Over 75% Off + 10% Off Code + Guaranteed Xmas Delivery! 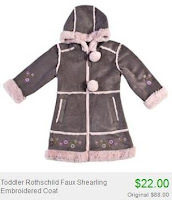 Wow, if you haven't gotten your child a new winter jacket yet, definitely head over to Totsy! There having a HUGE blowout sale with tons of different coats for boys and girls. Prices go up to over 75% off and start at just $9...plus this sale has guaranteed Christmas delivery! Check out the two pictured above...look at those savings! 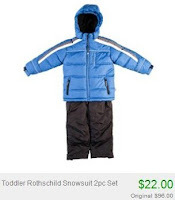 Only $22 for a $96 snowsuit! And there's even better deals at the site! Save even more money by using the code COUPONCABIN to take off 10%.